For more than 100 years Wenger has specialized in the field of professional kitchen knives and Genuine Swiss Army Knives. In 1963, Wenger developed the SWIBO line specifically for butchers and chefs. SWIBO knives are manufactured in Switzerland using a custom blended steel manufactured exclusively for Wenger. This exclusive steel blend produces a high- quality tempered, stamped blade that is resistant to wear and corrosion and has a 55-58 Rockwell hardness. Handles are made with a non-porous Swiss polyamide, which is injection molded and hermetically heat sealed directly onto the blade. This eliminates gapping between the blade and handle and ensures that the handle is hygienically and permanently sealed to the blade. The handle is ergonomically designed; non-slip texture and incorporated bolster provides a secure grip. Dishwasher safe; yellow handle makes knives easy to spot in sinks and water. 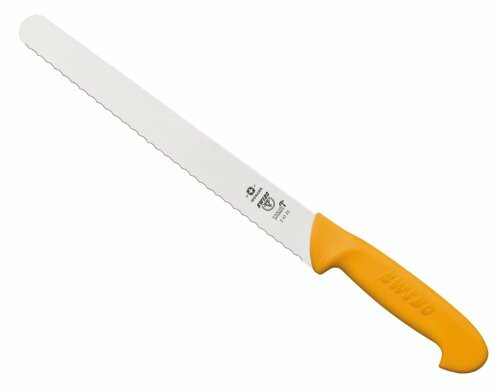 Deli knife has a serrated, flexible blade that measures 13-3/4-inch in length. If you have any questions about this product by Wenger, contact us by completing and submitting the form below. If you are looking for a specif part number, please include it with your message.